Belgian scientists wrote an open letter in which they ask for better climate policies. This open letter is a reaction to the several climate marches that were organized in the last weeks by schoolchildren skipping school. In a newspaper article (Dutch ahead), one of the organizers claimed that they want to feed the “climate debate with facts”. The word “fact” was mentioned six times throughout the article, so she wanted to emphasize that. A debate based on facts. I surely like the sound of that! That is also how I understand it. Something that exists, happened or is observed. Something in the future, a possible scenario or an assumption is not something that I would call a “fact”. The idea that climate change will strongly change our world is not doomsaying, but is based on hard facts. Hard facts? I like that even more, but I doubt very much that one can derive “hard facts” from the study of the long-time variation of an inherent complex, coupled, chaotic system with very limited reliable historical data. More or less, since there is some uncertainty involved. The average temperature is not something that is measured, but it is calculated based on temperature measurements. These are done by an uneven sampling and sampling is getting sparser when going back in time. So whether this is considered a fact depends on how certain we are whether it is possible to calculate an accurate global temperature based on such sampling. There were also numerous adjustments of this estimate of the average temperature in the last couple decades. While I can certainly agree that measurements show that the temperature have risen since 1850, how much the average temperature increased may change with a following adjustment. That would be very hard to assess in the complex, coupled, chaotic system that is our climate. Especially with only reliable measurements from the last decades and less reliable data the further one goes back in time. When I look at the actual SR15 report, then it refers to chapter 10 of AR5 report. In this chapter, the authors explain how such attribution studies work: trying to find a best fit of the measured (= calculated) increase by combining anthropogenic and natural responses. That one can hindcast a complex system containing a ton of parameters by varying a few parameters (solar variation, volcanic activity, greenhouse gases and aerosols) doesn’t make it a “fact”, let alone a “hard fact”. It rests on the assumption that those few parameters can sufficiently describe the changes in the complete system. That is not a fact either. The IPCC says something similar in their latest report, but much more nuanced and certainly not in terms of absolute truth. The IPCC also mentions things like climate model projections, regional differences and add certainty levels. None of this is mentioned in the open letter. That seems to be the common theme of all those points: certainty levels are missing and the points are stated with absolute certainty. If the previous points are “facts”, then it surely is crucial to limit such change. If all uncertainties are stripped, then yes, it is perfectly logical that we can change the climate back to what it was by reducing our emissions. But is this fourth statement really a “fact”? Something that exist, happened or is observed? It is derived from the previous three unnuanced statements, therefor I wouldn’t call it a “hard fact”. The second part of the statement, detailing what needs to be done, is a continuation of the first part, probably based on mathematical models. Ooops, that doesn’t sound well, especially if one is accepting that previous statements were “hard facts”. The statements of this point are also not “hard facts”. That policy measures fall short of what is needed, comes most probable from mathematical models, depending on the assumption that are put in them. They use present tense a lot in there (except for the social conflicts) for things that are in the future. While this might all be true, there is no guaranty that it is. That action is good and inaction bad, is not a hard fact. In reality, there are not only the uncertain effects of “doing nothing”, there are also the uncertain effects of “doing something”. Comparing both will lead to a huge pile of uncertainties. It is hard to predict something, especially in the future. Especially in a inherent complex, coupled, chaotic system that is our climate system. I don’t buy into the claim of “subsidies for fossil-fuels could be used to support renewables”. I looked into one such a claim before and found that these “subsidies” are not what one would think they are. They are unlikely to be used to facilitate renewables. Okay, now we can breath again. We can do it! It is already within reach! That is exact were they want the reader to be. If you strip off all uncertainties, the end conclusion becomes incredibly simple. If all the nuances and options would be told, then we would end up with a much less alarming conclusion and possibly a lot less signers. It is as if the scientists who wrote this letter forgot that the climate system is a complex, coupled, chaotic system and that it will be difficult to impossible to make accurate predictions of what will happen in such a system in the (far) future on the basis of one specific parameter. I could somehow understand that the media or the politicians rely on this strategy, but I am always surprised when scientists (who are assumed to be neutral) are doing this. Okay, but couldn’t these points and their conclusion be true, whether or not the organizers misrepresented these assumptions as “hard facts”? Of course it can, but this is not in the scope of this post. I just wanted to check the claim of the organizers that “the idea that climate change will strongly change our world” is based on “hard facts”. It isn’t. But then, the open letter is signed by several thousands scientists. Can’t we just rely on their expertise? So who are the scientists who agreed with those “hard facts”? Are they maybe experts in climate (related) fields? The newspaper article mentioned that 3,455 scientists signed the letter. This is confirmed by other media that mentioned the exact same number. I is hard to believe that there are 3,455 (climate related) experts studying climate change attribution in Belgium. When I however go to the page with the names of those scientists, then the claim is made that “more than 3,200 scientists signed the open letter”. That is 200 scientists less than the media is telling us. Why the difference? A quick analysis learned me that there are 3,278 names on that list, so the statement on that page seems to be correct and what the media brought us is incorrect. Although requests to sign continue to reach us in large numbers, we had to close the link to sign because it has been widely spread beyond its original target audience. The last part of that sentence is rather intriguing. Who exactly is the target audience (climate researchers, scientists, academics,…)? And who outside that target audience did also sign that petition? And has this something to do with the 200 missing signers? Just a search on some random names from the list gave some strange results. There were some researchers from Psychology and Biomedical sciences in that list. Are the signers who belong to those departments outside the “original target audience”? That made me curious about how many psychologists and biomedical researchers were on that list. I already noticed that five Rectors of Belgian universities signed as well. As far as I know, none of them has a degrees in climate related studies. Were they within or without the original target audience? Or were they allowed to sign the open letter because of the weight of their title? If I wanted to look into the matter, then I first had to make some selection. It is practically and time wise not possible to check all the 3,278 names on the list, so I decided to take all the signers of the University of Leuven. That is a large university, so I have more chance to get a representative result. A quick search revealed that there were 554 signers that gave “KU Leuven”, “KULeuven or some other variation as their affiliation. That is still a lot to check, but more doable than 3,278 names. In retrospect, I seriously underestimated the effort needed to go through 554 names. While checking the names, a strange pattern arose. There is a significant amount of signers from “soft sciences” (social sciences, arts,…). It also became clear that these signers were probably not the ones outside the target audience. It is rather elaborate to check, but there also seems to be non-academic signers, like library personnel and technicians (although they are a small minority, the vast majority of the signers are academics). That is probably why the organizers do not state that there are 3,278 signers on the list, but present them as “more than 3,200 scientists”. They don’t mention that there are non-scientists on the list, so by putting it that way they keep the appearance that this is a list of purely scientists. Which obviously is not the case. But then why the difference in size (3,400+ according to the newspapers) and 3,200+ according to the organizers? Is this already a cleaned up version of the list and did they just fail to remove a (couple) dozen names? In that case, a little more quality control is required. If I can find non-scientists in a subset of that list, then everybody else can do that too. Back to the analysis. From that 554 names there were 13 names that I could not find or were ambiguous. That makes 541 names left. One name shows up twice in the list although I only found one instance related to the University. The list seems to be a combination of several subsets and the two identical names are in the same subset, so I assume it is a duplicate. That makes 540 names left. The biggest group of people that signed the petition are those names connected to Earth & Environmental Sciences (91). No surprise there. They were very closely followed by Biomedical Sciences (81). Another surprising group was Psychology & Educational Sciences (59), closely followed by Biology (58) and Humanities & Social Sciences (58). Engineering was not that well represented (46), mostly those units that gain from the preferred solution (Electrical Engineering, Mechanical Engineering and Materials Engineering). Economics & Business (35) Biosystems [looks like the Agriculture department] (29) and Law (19) are other fairly large groups. The rest are a diverse bunch: Architecture, Languages (English, German, Greek), History, Theology, Mathematics and some supporting university services. Most, if not all, of the signers don’t do research on climate change and from the few who might do, I wonder how many could actually confirm those statement with thát level of certainty? Then why did they sign that petition? Most probably on basis of authority, but it could also have been out of sympathy for the cause or maybe even group pressure/professional pressure. With all my respect for those who signed the open letter and the expertise they surely have in their field, but it is my impression that the open letter, as it is presented, gives a sense of certainty that isn’t warranted. This entry was posted in Belgium and tagged Scientific Certainty on February 10, 2019 by trustyetverify. You have obviously spent a lot of time trying to discern “fact” from opinion and estimates. Point 4 contains something I have looked at last year in a few posts. That is the quantity of emissions required for temperatures to breach 2 degrees above 1850-1880 levels. There are a number of variables to consider. I will just look at CO2 alone. 1. How much of the warming is due to human emissions? – Assumed 100%, but AR5 WG1 could only state at least half the warming since 1950 at the 90% confidence level. From all human causes it is at 95% confidence. 2. Climate Sensitivity? AR5 had 3.0°C for ECS, SR1.5 2.7°C. TCR was reduced from 1.9°C to 1.6°C. The range of ECS in AR5 (& the 1979 Charney Report) is 1.5°C to 3.0°C. Lewis and Curry estimate it is the lower end of the range. 3. How long does the CO2 reside in the atmosphere? 4. Time taken for increases in CO2 levels to increase temperatures. This is partially captured in the TCR and ECS. Being am accountant (beancounter) I like to use the term “warming in progress”. That is the quantity of temperature rise being “manufactured” by the climate system at a point in time. All these factors are vague estimates. Consider the factors that will mean that it is already too late to stop 1.5°C of warming. – ECS too high. If ECS = 3, then a rise in CO2 from 280 to 396ppm would eventually produce 1.5°C of warming. This was passed in 2013 or 2014. – CO2 residency in the atmosphere is many decades. – Other GHGs like CH4 play a role in warming. CO2 is only about 75% of the GHG impact. – Some of the past warming is not due to GHG emissions. Headline example from AR5 – presentation to summarize the SPM of the final synthesis Report. 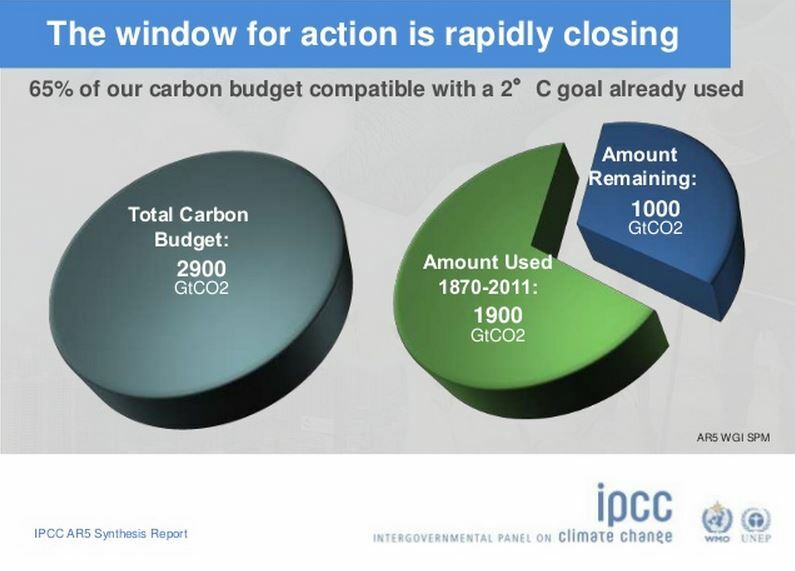 1000 GtCO2 of emissions from 2011 to achieve 2C of warming. What we have is a delicate balance of estimates. If a number of factors are too much one way then any given level of warming has been breached. But if they are the other way then the amount of warming from human emissions is much less than previously estimated. There is a fundamental problem with climate mitigation policy that is totally ignored. It is that emissions are global. If dangerous climate change results from emissions, then to stop that from happening requires global emissions to be cut. It is made clear in point 5, but then it is assumed that action on climate change is also global. It is not global and will never be global. The Rio Declaration 1992 divided countries into three groups – developed, transitional and developing economies. There was no obligation for the poor developing economies to cut their emissions. These countries now have >80% of the global population and >60% of global emissions. The transitional economies – the former communist countries – could wait before cutting their emissions. The Paris Agreement also exempts the developing countries from cutting their emissions quickly. It does not take much thought to realize that global emissions cannot be reduced to zero if >60% of those emissions come from countries who are not going to reduce their emissions any time soon. In fact these countries (lead by China & India) have increased their emissions in the last 30 years, and will likely continue to do so for many years. Point 6 does not work if policy is not global. The claim is that “we” spend money now, or “we” bear much larger costs later. But if Belgium on its own spent money on reducing emissions future generations in Belgium would see slightly reduced costs from slightly less warming, as would all the other countries who spent nothing. The countries that are best off are those that do nothing, but get as many other countries as possible to spend money. Politically, the countries that are best off are those that appear to do a lot but actually spend little. This idea of cost of climate change comes from the work of William Nordhaus, who shared the Nobel Prize in Economics last November for this pioneering work. He imagined costs of climate change would be a quadratic function of temperature, so 3C of warming has 9 times the cost of 1C and 4C of warming 16 times the cost. I believe that the UK Stern Review 2006 approximated to a quartic function. So 3C of warming has 81 times the cost of 1C and 4C of warming 256 times the cost. Whichever the shape of the cost function, if true, most of the costs of climate change can be eliminated by immediate action by a small minority of countries.